Even after connecting the stove to new LPG cooking gas cylinder, large burner has medium flames and small one not working. How to fix? Gas stove is not properly working after connecting to new cooking gas cylinder. Large burner has low flames and small one not working. How to fix? A couple of months back, we faced an issue after connecting new LPG cooking gas cylinder with stove. After attaching the regulator to cylinder and keeping the regulator knob on ON mode we tried to ignite the burner. The large burner caught Flames but has medium flame even though it is high mode, but the small burner was not at all working. So we cleaned all tubes and pipes in the stove , but still there was no progress. As a last attempt , we disconnected the regulator and shook the gas cylinder several times and then connected it back and ignited the burner. This time both burners worked normally. Same burner issue happened few days back when new cylinder was fitted. I just did the process mentioned above and it worked fine. Later I called a cooking gas service person , just to confirm the reason of this behavior. He told me that, in some cylinders, the pressure levels may be little high which prevents the normal flow of LPG gas. So when we shake the cylinder, this affects the pressure and it gets adjusted. Even though we do not shake the gas cylinder, after few hours of gas flow, both burners will work properly. 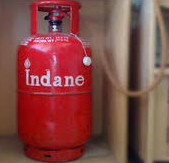 In short: Before connecting a new LPG cooking gas cylinder to your gas stove, shake the cylinder few times before connecting the regulator to it. You can try above method for fixing following issues. It is always suggested to contact a service person in case of emergency. Small burner not working after new lpg gas cylinder is attached. Medium flames in large burner of gas stove after connecting to new gas cylinder. LPG cooking gas flow reduced after connecting new cylinder.